← The ORIGINAL Sin?!? Part 1 in a series . . . The First Fridays Worship Music OPEN MIC has gone mobile!!!! Formerly held at The Way of Life congregation downtown , we are now mobile and will be setting up in host congregations all over Kansas City from this point on. 14 For He is [Himself] our peace (our bond of unity and harmony). 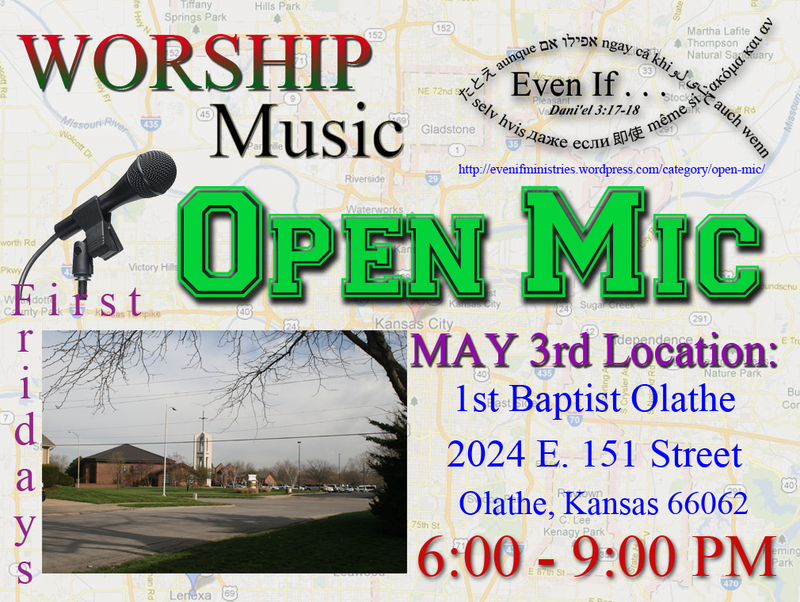 This entry was posted in OPEN MIC and tagged 1st Baptist Church Olathe, 2024 E 151st St, First Fridays, KS, music, Olathe, OPEN MIC, Worship. Bookmark the permalink. We end each Open Mic with How Great is our God. We try to get as many of us as we can to all play together when we do. In our last one, we did it in English, Hebrew, Arabic and Spanish. Wish I could be there but…having a medical procedure that day. Good luck and have a joyous time praising our Lord!